From our founding, Well Beyond Care has had a focus in helping veterans. Two of our original investors, are both veterans, and the Company was designed with a special place for our vets. We know that many veterans would like to work as a caregiver, but have not due in part to the difficulty in finding a position that pays more than $9 per hour. Part of what makes our service veteran focused is that we can offer well paying caregiving positions for those veterans who would like to continue their “service” to America. Most notably, these positions pay 25% to 40% more than what a veteran can make at a private-duty agency and Well Beyond Care gives our caregiving Veterans the flexibility to chose the individuals they want to give care to and the hours they want to work. The Well Beyond Care curation system matches veterans who want to work as caregivers with veterans seeking care. Veterans have asked the Company to give them veteran caregivers, and that is what we do. It is nice to have another vet dress your wound and hear “war stories” as opposed to having a 20-year-old-someone who does not understand the sacrifice a veteran made for his country in getting that wound. In addition, our nationwide network of nurses also inform vets about their “Aid & Attendance Benefits” afforded them as part of their VA pension and will help them with getting reimbursement for caregiving costs. These nurses also serve as a resource to medical resources in the areas were a veteran is receiving care. Because we are able to save individuals money and pair them with better caregivers, we keep vets out of the hospital, and aging in place more affordably (the get more care with less money). In addition, we have teamed with a palliative care / hospice organization that can offer doulas for those veterans facing end-of-life situations. 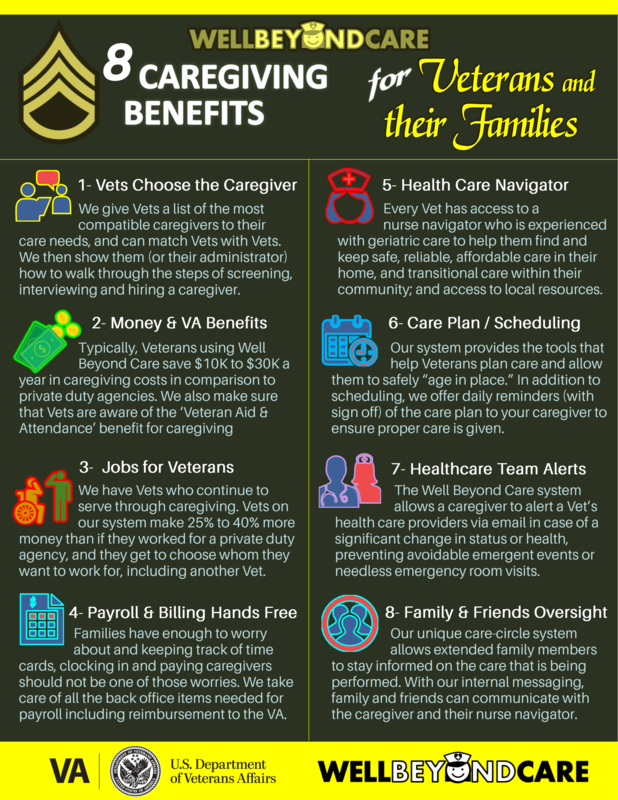 Below is a graphic on the benefits Well Beyond Care affords veterans. To get a larger view or download, just click on the image. In summary, Well Beyond Care offers an online caregiving curation, matching and management system for those veterans looking for in home care. While most private duty care is administered by agencies, Well Beyond Care teaches and guides a Careseeker (most likely an adult child looking for care for a parent or veteran) on hiring their own caregiver. Compared to traditional private-duty agencies, veterans can save $10,000 to $30,000 per year, and caregivers who might be veterans, make $3 to $6 per hour extra using our service. It combines the best in caregiver hiring (matching, screening, ratings & background checks) with all the back office functions (verified time worked, payroll, scheduling, and documentation) to insure safe, reliable, dependable, affordable care is obtained for our deserving veterans. Well Beyond Care, its logo, Care Taken to the Next Level and Empowering Caregiving are Registered Trademarks of Well Beyond Care, Inc.